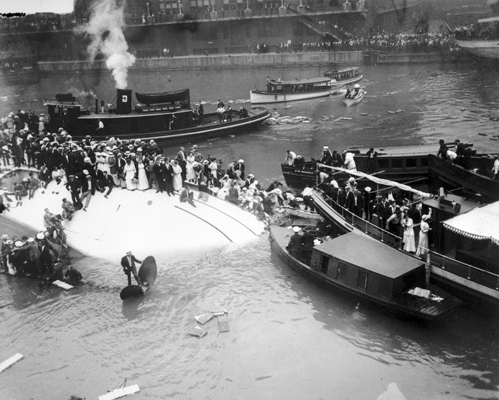 On the morning of July 24, 1915, Chicago’s greatest tragedy occurred on the Chicago River between Clark and LaSalle Streets. The Western Electric Company of Hawthorne had chartered 5 boats to depart of a 2 hour cruise with their employees, their family and friends to Michigan City, Indiana for a planned parade and day long company picnic. 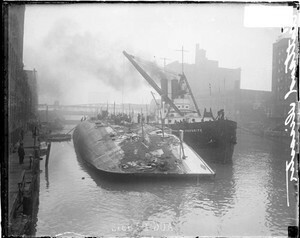 The S.S. Eastland, one of the chartered boats, was docked at the Clark Street Bridge on the Chicago River. It did not take long for the Eastland to be filled to capacity, with over 2,500 passengers. Little did the enthusiastic passengers know, the Eastland would never reach its destination. 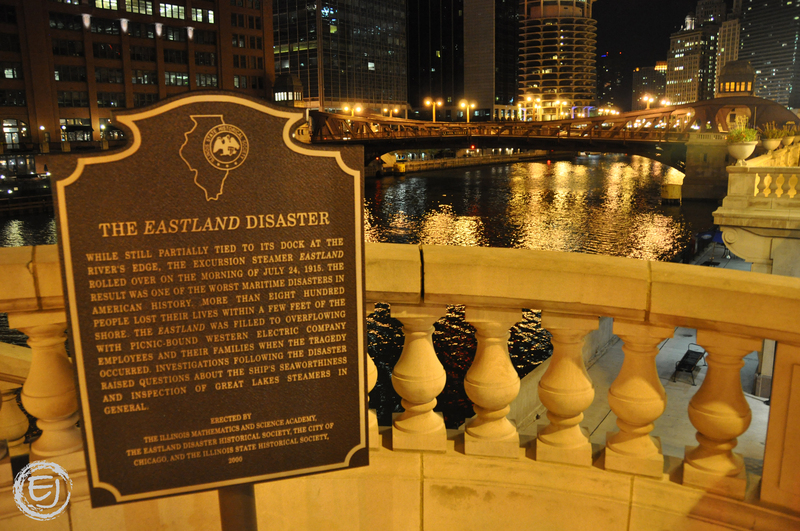 The Eastland rolled over onto its side at the wharfs edge, creating one of Chicago’s greatest disasters. Although rescue efforts were fast and furious, the disaster claimed 844 lives within minutes, including 22 complete families. George Halas (George Stanley Halas, Sr. (February 2, 1895 – October 31, 1983), was a player, coach, owner and pioneer in professional American football and the iconic longtime leader of the NFL’s Chicago Bears.) worked for Western Electric at the time and was supposed to be on the S.S. Eastland. But he was running late that day and by the time he got there, the tragedy already had happened. If he had been on time, the Chicago Bears may not exist today and professional football as we know it might be vastly different. The 2nd Regiment Armory was used as a makeshift morgue for over 200 victims of the Eastland Disaster. Oprah Winfrey’s Harpo Studios now occupies the old armory. Many who work here claim that the ghosts of the perished passengers are still restless in the new studios. According to reports, many employees have had strange encounters that cannot be explained, including the sighting of an apparition that has been dubbed the “Gray Lady”. In addition, staff members hear whispering voices, the laughter of children, sobbing sounds, old-time music, the clinking of phantom glasses and marching of invisible footsteps. The footsteps (which sound as though they belong to a large group) are frequently heard on the lobby staircase and nearby doors often slam shut without assistance. A large number of the staff members believe this to be a very haunted place. The site of the disaster is not without its chilling stories either. Today, the site is marked by a historical plaque, commemorating the memories of those whose lives were lost. Some say it is marked by other things as well….. namely cries of terror from the victims of the tragedy. 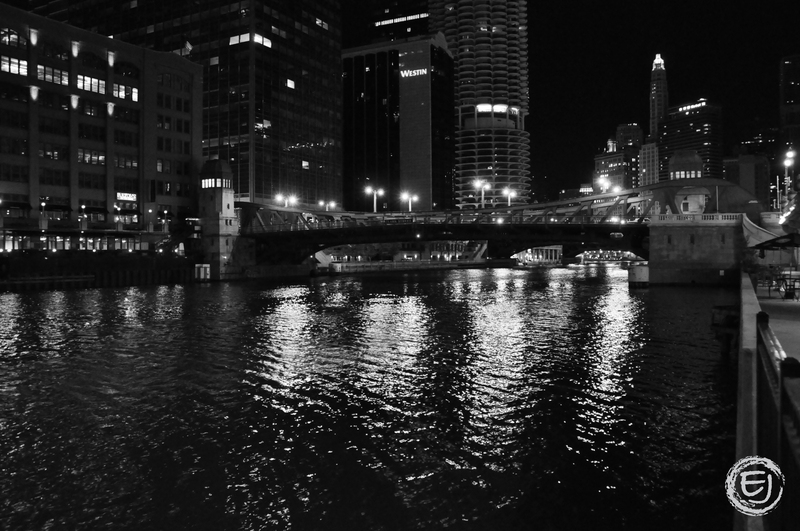 For many years, passersby on the Clark Street Bridge claimed to hear cries and moans coming from the river, along with the bloodcurdling sound of terrified screams. Perhaps the horror of the event impressed itself on this place, where it continues to replay itself over and over again…. The causes of the disaster have never been confirmed, but several theories are well known. The steamer had a reputation for being top-heavy with a very temperamental ballast system. The addition of more lifeboats before the Western Electric excursion also increased the instability of the vessel. Ever wonder what happened to the Eastland after the tragedy? The Eastland was raised after the wreck and sold to the Naval Reserve and converted to a gunship. It was renamed the USS Wilmette and used for training during the war while it was station at the Great Lakes Naval Station. And in 1943, the Wilmette was given the honor of transporting President Franklin D. Roosevelt, Admiral William D. Leahy, James F. Byrnes and Harry Hopkins on a 10 day cruise to McGregor and Whitefish Bay to plan war strategies. That’s pretty crazy that a ship that killed 844 people was commissioned in the military and then actually transported the president! The shot above of the river is the exact location where the Eastland capsized which happened right in front of the Britannica building (featured in the other photo above) which existed at the time of the accident and can be seen in the background of some historical photos. So I took these photos late one night a few weeks ago. 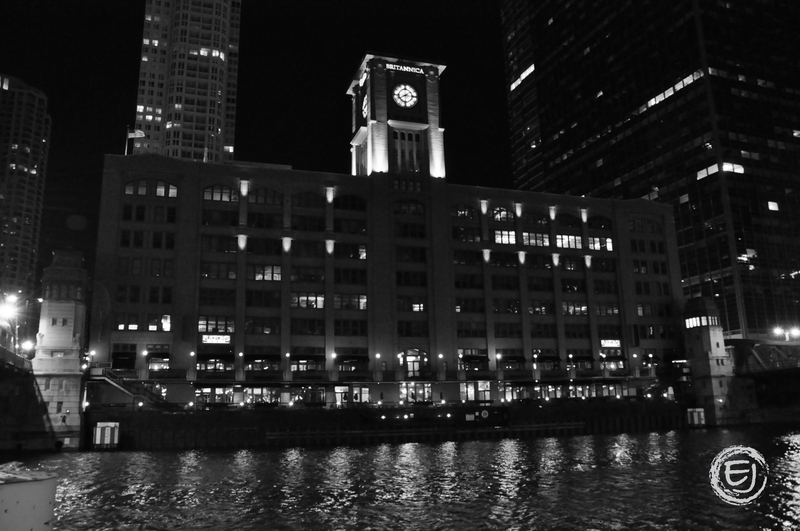 I headed to the Eastland Disaster site on the Chicago River while I was out taking photos at various locations around 3:00 in the morning as I was trying to avoid the large numbers of people that you normally find walking around the city. I also stopped out there so late because I wanted to see if I could experience some of the moans and screams that I have heard stories about. I’m not sure why I was interested in experiencing this for myself since if I did hear anything unusual, I’d have to chalk it up to the homeless people that reside on Lower Wacker just steps away from where the Eastland capsized. But regardless, in the spirit of Halloween, I wanted to create the best environment possible that would allow me to creep myself out. And I must admit, it kinda worked. Now I didn’t see any “ghosts” and I didn’t hear any disembodied voices trying to communicate from beyond the grave but I did catch an odd vibe in the air. I’m sure it had a lot to do with being downtown at 3am when the streets and sidewalks were absolutely desolate. Just a few blocks to the north, the clubs scene was jumping but in the Loop it was dead silent. I could literally stand in the middle of Wacker without a single cab driver blaring his horn and flipping me off. And when I was on the river walk itself taking photos, I was all alone in a poorly lit area vulnerable to anyone who might want to acquire a nice new Nikon D5000 from some unsuspecting photographer. Just another reason for me to be on edge. But I think the kicker was when I returned to street level to take photos of the Britannica building. Out of nowhere I heard the most eerie, creepy, unexpected sound of wind chimes coming from behind me. Now this isn’t really a big deal in the suburbs or even in the residential areas of Chicago. But in the Loop? I’ve never heard wind chimes in the Loop. Not to say that it’s impossible for someone to hang wind chimes from a skyscraper but I just found it odd. I also found it strange how I didn’t hear it once the first 15 minutes I was there just walking around but after coming back up from the river walk, it just started happening out of nowhere. Not to mention the fact that I couldn’t pinpoint where it was coming from. I walked up and down the sidewalk several times trying to track it down with no success. Even with the air being dead still, it kept coming and going the rest of the time I was down there taking pictures. Again, I know this wasn’t some paranormal knickknack chiming from hell’s front porch. In fact, I think it may have been coming from the construction site across the street from the river but it just enhanced the weirdness I was feeling while being down there that night. So after all was said and done, no ghost sighting, no ghoulish moans or screams and no muggers trying to steal my camera at 3:00am. Overall, it was just another great experience to have leading up to Halloween and another great location to visit from Chicago’s storied history. This entry was posted in Chicago, Historic Landmarks, Life and tagged Eastland Disaster. Bookmark the permalink.